Blend garlic and basil in a food processor. Add cashews, process. Add lemon and a little olive oil. Work into a paste. You need to start and stop to scrape down the contents on the food processor wall, several times. To get a paste takes about 15-20 minutes. Ideally let the paste stand overnight. Add half the non-dairy cream to a pot, add the basil & cashew paste, blend with the cream. Add the rest of the cream and ensure the sauce is really smooth and evenly blended. Add the veggie stock cube by crumbling it over the sauce. Let simmer together on very low heat. Oil a deep oven dish, I used a 28 cm x 18 cm large dish. Place a layer of one vegetable in the bottom. Pour some sauce in the middle, spread it out with a spoon. The sauce should be a very thin layer on top of each vegetable layer. Don’t ad too much. Then add another vegetable layer and then add sauce, continue layer veggies and sauce until you have your final top layer. Then add a thick layer of sauce on the top. Place the dish in a preheated oven, bake on 200 C for 40 - 60 minutes. Check halfway and cover with tinfoil so not to burn the top layer. Don’t seal the top of the oven dish, place the tin foil in such a way that the steam from the veggies can escape and evaporate. The gratin is done when it has a golden brown top layer, the aubergine and zucchinis are tender and the majority of the fluid from the vegetables have cooked away. I use only one vegetable for each layer. If a fan assisted oven, let steam out every now and then. 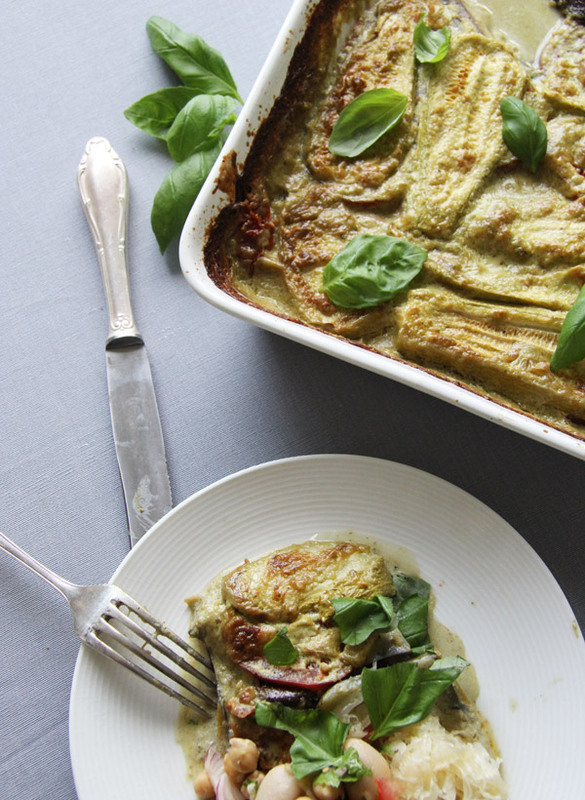 Ensure you use more aubergine then zucchini, otherwise the gratin will become watery. this looks great! I have eggplant and zucchini from my garden but I have a couple of questions. What do you mean with vegan cream? And what measurement is ‘dl’? I’m originally from Germany, now living in the States but I haven’t seen this in either country. Thx! 1. Vegan cream - now days you can buy an assortment of vegan creams, as in plant based creams to use instead of diary cream when you cook. Your local super market probably has a variety to choose from. The most common one is soy cream, but if you get the opportunity, try the oat cream as it's great for cooking gratin's!